One of the finest Art Deco buildings in Asia and one of Manila’s best structures, the Jai Alai stadium was demolished on July 15, 2000 commanded by then Mayor of Manila, Lito Atienza. An Architecture graduate and allegedly a regular bettor of Jai Alai, he said a court justice will replace the site but it was NEVER done. This four storey building located along Taft Avenue was noted more of gambling, crime and prostitution rather than its sleek, cylindrical glass front to convey that the world’s fastest sport in the world was held here. It was while taking my Spanish language class last year at Instituto Cervantes Manila I noticed that this Jai Alai game is played a few steps away from the school, in Casino Español de Manila. Out of curiosity I decided to interview these people who play the game. Are they still the same kinds of players who do this out of money or pleasure maybe? Jai Alai originally came from Basque, Spain. Whenever they have feasts they play this and they call it as cesta punta. 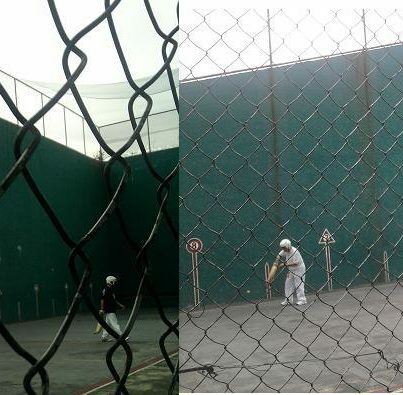 There are only two known places in Manila where Jai Alai Game is played one here and other one in Project 8 ,Quezon City. Their group is called CEAPA (Casino Español Amateur Pelotaris Association) and in Quezon City is the MAJA (Manila Amateur Jai Alai Association). They pay P60 per head for a certain amount of time and most of the players are working in Casino Español at the end of their day shift they play this game before heading to home. The Jai alai racket or cesta which looks like a curved scoop is made of chestnut bark all imported from Spain. The players would have to order this first and have someone skilled usually a co - player to assemble the racket here. The materials cost P5, 000 and the labor fee is P 2, 500 so a total of 7, 500 if you want to get a brand new one. I asked if we can have an equivalent local product to replace the chestnut bark, they said the closest is the yantok but it is heavier so they still opt to the first one. When hit by the Jai alai racket, the rubber ball or called pelota can travel at around 200 – 300 km per hour! This is a bit risky if one is hit by this ball in any parts of the body that is why only men are inclined to play this game. While watching them play I can hear the loud noise coming from the bouncing ball being smashed in the three walled court and I can really attest that this is not a game for everyone. They should be very attentive all the time not just to avoid being hit by this “raging” ball but to smash it with back to the court opposite to them. Two places in the country that Jai Alai is very active are in Cebu and Cagayan where it is televised locally. The CEAPA have annual tournaments held every October so that their practice is not wasted. Anyone or should I say any man can join them with an annual fee of P500. At the moment their group is only 100 + composed of Filipinos and Spanish individuals. I asked them if they also do bets on their game they said “No”. I asked them is it why because it is against their group’s policies or they just don’t want to bet and just play the sport. They answered the second one. The last question I asked which it took me a few deep breathes and certain amount of courage is why most of the players are all grown-ups. Where the younger ones who will make this sport live in another decade or so? They said this is one thing they feel a bit sad about that very few young men are interested to play Jai Alai. They want to take this opportunity to invite them and play with them if not this sport will be gone forever like that building. NOTE: The man above is Ricky Reyes. He has been playing the game for 15 years on and off. He can repair and assemble Jai Alai rackets for a fee. You may contact him at this number 0928 - 713 - 0404.